One title jumps out at me this week: Legends of the Dark Knight: Jim Aparo. Yes, it’s pricey at $49.99 but it collects all the Brave & the Bold team-ups drawn by a man many call the definitive Batman artist, even over Neal Adams and Jim Lee. A great book for any Batman fan and the guest stars are from all over the DC Universe. This past week I picked up a copy of Marvel’s Avengers vs. X-Men #0 from my local comic book shop. I don’t usually read the paperbacks, but since the series is including a digital copy with each one, I figured why not. Without knowing anything about the current state of the X-Men / Avengers universe, I was a little lost on a few things. In the X-Men Animated Series, you rarely saw the Avengers. Since that was my only exposure to who was on the team, seeing Scarlet Witch as on of heroes threw me off. The story begins by giving you a look at the Avenger’s side of things. 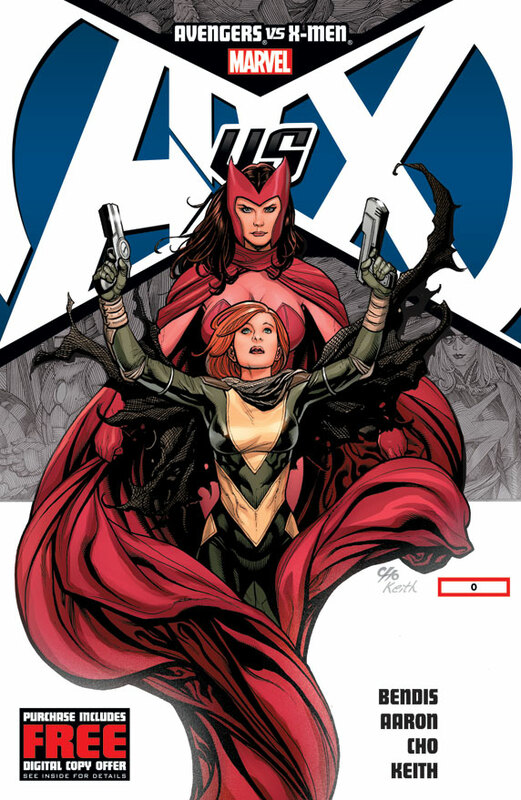 In the first few pages, it’s made clear that the Scarlet Witch is a disgraced Avenger. Against her better judgment, she is taken to the Avengers mansion by Ms. Marvel and Spiderwoman. Vision meets her at the front door and makes it clear that she is not wanted. I don’t know all the details of how Scarlet became an outsider to the team, but my heart broke for her. We are left seeing Ms. Marvel have sympathy for a crying Scarlet and she flies her away from the mansion. The story eventually jumps to the X-Men side of things. We meet Hope Summers, a teenager and messiah of the mutant race. She has a spat with Cyclops and runs off to help in a hostage situation that she hears over the police scanner. Cyclops and Emma Frost come to her aid and save her skin in a fight against the Serpent Society. We are left watching Hope wash blood off her hands while looking into the sky. My guess is that she is thinking about her fate as well as the coming of the Phoenix. Between the two sides, I felt emotionally more connected with the Avengers than the X-Men. Hope’s story did not capture me at all. To be honest, I had to go back and re-read it before doing this review to remember what happened. It was far easier to remember Scarlett Witch and her situation than Hope’s. I can already see myself rooting for the Avengers. In March, the five issue series Flashpoint was released as a graphic novel by DC Comics. Flashpoint follows Barry Allen as he wakes up in an alternate world where Superman is missing, Aquaman and Wonder Woman are engaged in a battle that has claimed millions of lives, and Batman is a changed man. Barry struggles to keep his memories of his own world while preventing the new one from collapsing in a devastating war. I’ve been a fan of Barry Allen since The Flash television series in the 90’s — John Wesley Shipp made me swoon — so I was happy to read a story with Barry as the main character. I also enjoy “what if” stories even though they usually don’t amount to much; almost all of them end with a reset button and everything goes back to normal. But in the case of Flashpoint, it actually does matter. The timeline changes caused by the events of Flashpoint lead directly to the world of the New 52. This Flashpoint novel is a collection of just five issues, so there isn’t much time to get invested in the alternate world, but it still tells a complete story. If you want to dive deeper into the horrific timeline that Barry finds himself in, there are other Flashpoint related story lines and issues to pick up. Reason why The Vision refused Scarlett Witch inside the mansion cause during the Decimation storyline she was responsible for the death of various avengers one of which was Vision. Wow! Thanks for that. I feel bad for both Scarlet and Vision. They look like they made a good couple. They started to go bad when it was revealed their twin children were figments of Wanda’s Hex Power. Er, then they weren’t, and instead their souls were reborn into a couple of the Young Avengers. Vision & the Witch are complicated. 🙂 It’s worth noting that apparently Wanda was truly clinically insane for quite a while due to past events and possible mental control by Dr. Doom. I’ve lost track of the Avengers for a while. I keep wondering where Simon went.